There is a tiny, thoughtfully curated bookstore on a North-west corner of San Francisco's Potrero Hill neighborhood. I was a few minutes early for a lunch nearby and couldn't help but pop in for a quick browse. Five minutes later I walked out with Lunch at the Shop: The Art and Practice of the Midday Meal. 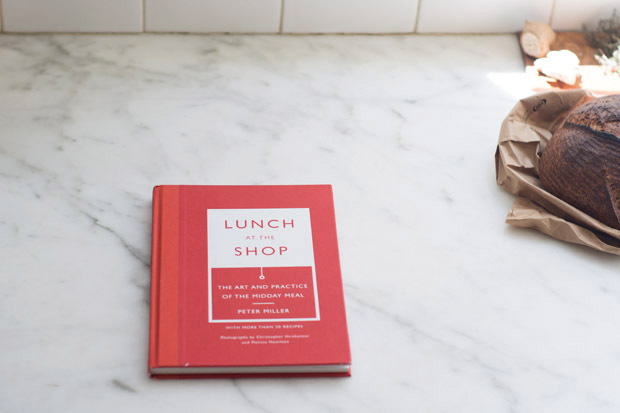 It is an inspired volume by long-established Seattle book store owner Peter Miller celebrating the simple pleasures achieved by taking and appreciating (what I consider) a proper lunch. The emphasis is firmly put on food that is simple, fresh, thoughtful, and often communal. Said another way - lunch doesn't need to be complicated or elaborate to be meaningful. Taking time for lunch. This book struck such a note with me because there are few things that can make more of a difference in your day than this gesture. It's something I believe in, and something I do my best to put into practice whether I'm sitting down by myself, with a few friends, or with many. There is something incredibly positive and optimistic about this small volume with the happy, tomato-red cover. 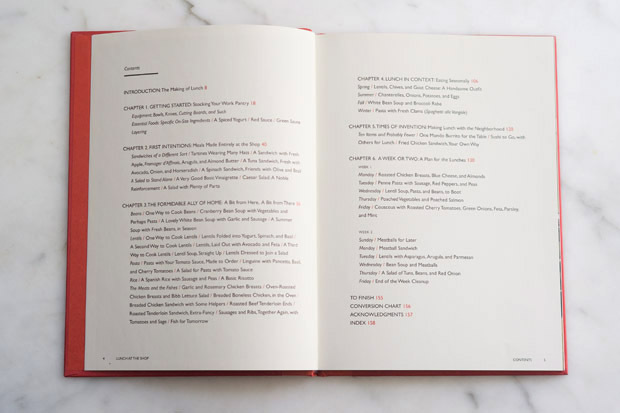 On a practical level it is filled with thoughts and advice on how to eat well, pace your day, and stock your work pantry...but it comes together into something beyond the sum of its sections and chapters. I love that it exists as a reminder of how important this break in the day can be - how it can help relationships grow, how it can help energize, nourish, and revive, and how in-sourcing lunch can bring a bit of magic to a work environment. I made the Lentils folded into Yogurt, Spinach, and Basil. A double batch, in fact. 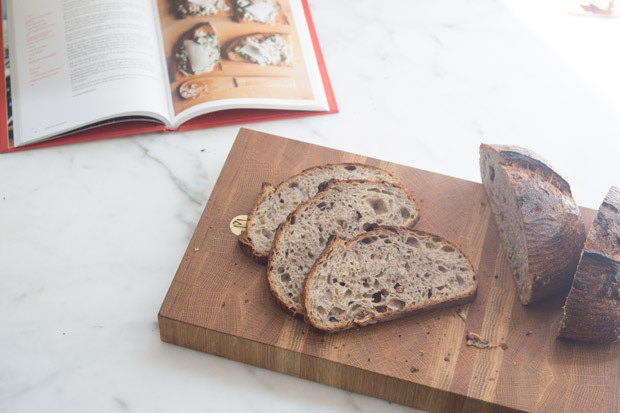 It was enjoyed on walnut bread, tartine-style, for multiple days. Friends that can't handle wheat or gluten can enjoy this combination on appropriate crackers or wrapped in a sturdy, fresh leaf of romaine lettuce. It has lentils, loads of spinach (arugula is great too), herbs, and Greek yogurt - a hearty, healthy, satisfying line-up of ingredients that set you up strong for the rest of the afternoon! Make the lentil mixture ahead of time, then assemble at work. 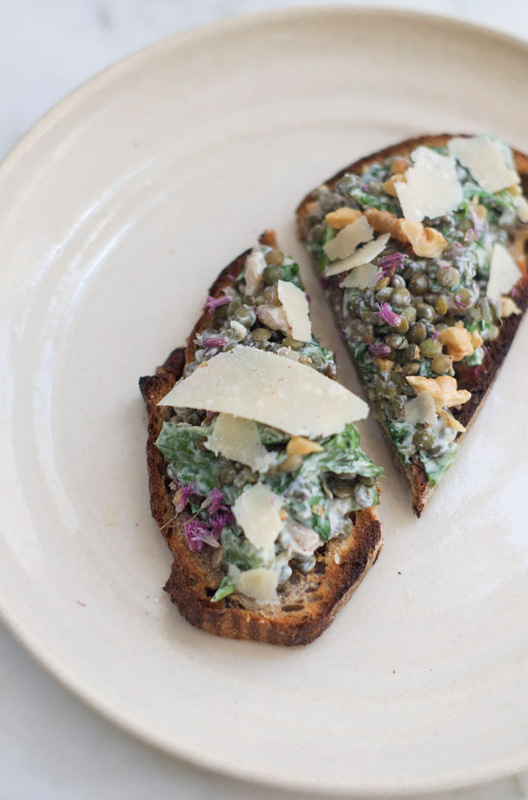 It's great atop a slice of toasted bread, on its own, or in a lettuce leaf. Heat a small saute pan over medium heat. Add the pine nuts or walnuts and cook until lightly toasted, 5 to 7 minutes. Lay them out on a wood cutting board to cool, then chop them roughly to the size of the lentils. If your knife is sharp enough to slice the spinach and basil leaves without bruising them, gently cut them into bite-sized pieces. Otherwise, tear by hand. Place the lentils in a bowl and mix in the spinach, basil, parsley, and garlic. Squeeze the lemon into the lentils (mindful to omit the seeds), mix, and then fold in the yogurt. Mix again, and then pour in the olive oil, stirring, as you do, to combine. At this point, taste the mixture, and season with salt, and two good grindings of pepper. Finally, fold the roasted nuts into the dish, and finish with a drizzle of oil. The lentils and greens will keep in an airtight jar in the refrigerator for at least three days. When you're ready to assemble, bring the lentil mixture to room temperature. Give it a taste, and adjust with more salt or some lemon juice. It can go on toasted levain, or along with lettuce (as more of a salad), or in a large lettuce leaf (as a wrap). Finish with some Parmesan shavings. I also couldn't help add some herb flowers I had on hand, but those are, of course, optional. Absolutely everyone needs a great lentil soup in their cooking repertoire. Here's a selection of some of the best. A crowd-pleasing lentil and tomato-based stew, dotted with plump, tender dumplings, spiked with a range of spices, and boosted with plenty of spinach. There are a lot of chana masala recipes out there that are perfectly good, but this is the chana masala you should make tonight - a Technicolor version of chana masala.